Sleep, like food and water is the basic necessity of life. But looking at the living patterns today, we find, not only adults but even children face the problems of sleeplessness. So, let us understand, what is sleeplessness? Sleeplessness or sleep deprivation is a state caused by lack of proper amount of required sleep that may be voluntarily or involuntarily. But sleep deprivation is much more than this! Greater the degree of sleep deprivation, greater is its adverse effect on the overall human health. Insufficient sleep (less than 7 hours) can pose serious threats on your cardiovascular, endocrine, immune, and nervous systems. Shorter the sleep, greater is the obesity. Deficiency of proper sleep in an individual leads to greater cravings for food, particularly sweet and starchy foods which leads to a considerable gain in weight. Improper sleep is associated with higher levels of ghrelin and lower levels of leptin. Ghrelin is a peptide that stimulates appetite and tells you when to eat, while leptin is the hormone that suppresses appetite and tells you to stop eating. Insufficient sleep leads to generation of higher levels of grhelin and lower levels of leptin in the body thus causing increase in appetite, leaving you craving for food. This ultimately leads to gain in weight leading to obesity. A 2006 study published in the International Journal of Obesity observed that there is an inverse relation between sleep duration and the risk to develop overweight/obesity. Another 2008 study published in the Sleep-New York Then Westchester journal reported a consistent increased risk of obesity amongst short sleepers in children and adults. The longer you are awake at night, greater is the risk of diabetes. Deprivation of sleep can lead to your body’s resistance of insulin, a precursor to diabetes. Insulin helps the body in utilizing glucose for the generation of energy. But lack of proper sleep disrupts the circadian rhythm of the cells causing their failure to break down sugar into energy. This improper utilization of the hormone results in rising levels of blood sugar leading to type-2 diabetes. So, lack of proper sleep hours may worsen your insulin sensitivity. A 2006 study published in the American Diabetes Association journal concluded that short sleep duration is associated with increasing odds of diabetes. Another 2006 study published in the same journal reported that men with short sleep duration were twice as likely to develop diabetes. Further, the study highlighted that short term partial sleep restriction resulted in insulin resistance and glucose intolerance among individuals. Sleep loss is associated with various cardiovascular ailments like strokes, heart attacks and increased blood pressure. When you are chronically sleep deprived, the level of HDL or the good cholesterol in your body gets low and you are likely to gain weight. This further results in building up of plaque in arteries posing great risks of heart problems upon you. 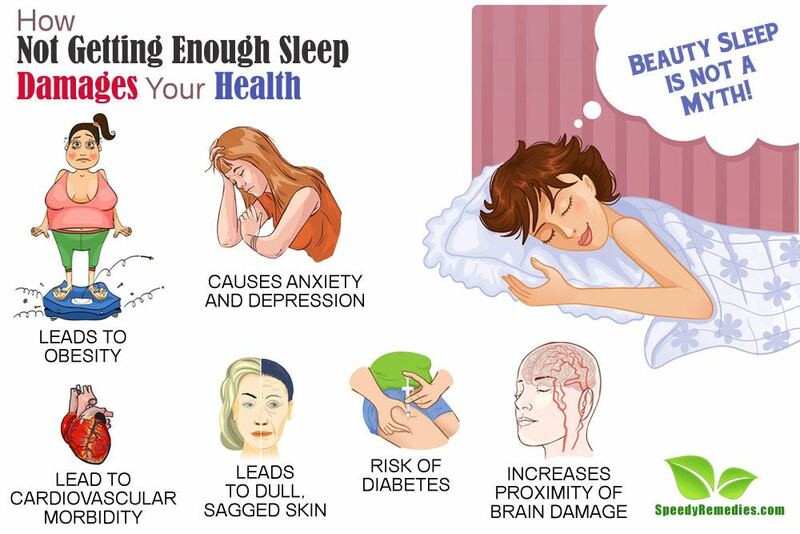 Proper sleep is very much required for the efficient functioning of the body to heal and repair the blood vessels. Further, shortened sleep leads to increased calcification (calcium deposit) of coronary artery posing greater risks of strokes and attacks. Also, lesser sleep increases C-reactive protein in body leading to hypertension and other cardiovascular disorders in the body. A 2004 study published in The Journal of the American College of Cardiology concluded that both acute total and short-term partial sleep deprivation resulted in elevated high-sensitivity C-reactive protein (CRP) concentrations, a stable marker of inflammation that has been shown to be predictive of cardiovascular morbidity. Further, the study proposed that sleep loss was one contributing factor to activation of inflammatory processes leading to cardiovascular morbidity. Another study in 2011 published in the European Heart Journal reported that short duration of sleep was associated with a greater risk of developing or dying of coronary heart disease and stroke. Deprivation of sleep has an adverse impact on the mood and behavior of individuals. People with chronic sleep loss face excessive mental distress, anxiety and depressive symptoms. This further leads to their resorting to alcohol for busting stress. Loss of sleep fires your insular cortex and amygdale (the regions in brain accounting for emotional processing) causing stress and anxiety in you. A 2006 study published in the Sleep journal reported that sleep duration below or above the median of 7 to less than 8 hours per night was associated with an increased prevalence of hypertension, particularly at the extreme of less than 6 hours per night. A 2007 study published in the Sleep Medicine journal observed that two nights without sleep led to an increase in symptoms of psychopathology, particularly for somatic complaints, anxiety, depression, and paranoia. Sleep is considered to be a restorative process vital for the proper functioning of the immune system and deprivation of sleep leads to impaired immunity. While you are asleep, your immunity system produces infection fighting cells and cytokines for the protection of the body. These antibodies are used as a tool in fighting germs, bacteria and viruses. This provides more energy to the immunity system for the protection of body against illness. Improper sleep causes dysfunctioning of the immunity system and it is not able to build up forces for defending the body against foreign forces. This causes impaired immunity and the body takes long time to recover from any kind of illness. A 2002 study published in the Brain, Behavior and Immunity journal reported that sleep and sleep loss have effects on immune processes and nocturnal secretion of cytokines. Another 2011 study published in The Open Respiratory Medicine Journal concluded that there is a significant relationship between sleep and the immune system. Sleep deprivation is associated with increased daytime sleepiness, reduced euro-cognitive performance and fatigue. Sleeplessness is more than just stress and anxiety. Lack of proper sleep may pose serious threats on the mental health of an individual. Loss of sleep tends to increase the level of molecules that are responsible for brain damage. Improper sleeping patterns many lead to increase in several brain molecules including neuron-specific enolase (NSE), and S100 calcium-binding protein B (S-100B). Rise in the levels of these molecules indicates that the brain tissue is beginning to be damaged. A 2000 study reported that sleep deprivation led to impaired decision making involving the unexpected, innovation, revising plans, competing distraction, and effective communication. A 2006 study published in the Sleep Medicine Reviews journal observed that short-term and long-term sleep deprivation is associated with the up-regulation of hundreds of genes in the cerebral cortex and other brain areas. These include genes involved in energy metabolism, synaptic potentiation, and the response to cellular stress. Another 2010 study published in the Progress In Brain Research journal claimed that sleep loss adversely affects creative, divergent and innovative aspects of cognition in an individual. Wish to live longer? Take longer naps then! People who take 6-7 hours of regular sleep tend to outlive those who sleep less. Also, several nights of improper sleep can result in more than 700 genetic changes in the body, ultimately affecting your health. Sleeping less than 6 hours a day increases your mortality rate by approximately 15 percent. Beauty sleep is not just a misconception. Sleep deprivation can cause your skin to appear rough and dull with fine lines and wrinkles. Improper sleep leads to excessive release of cortisol (stress hormone) that breaks down collagen in the skin. This further leads to damaged, sagged and dry skin moving towards signs of aging. Also, lack of proper sleep reduces the skin’s ability to cope up after exposure to sun. Besides the above effects on health, lack of proper sleep also imposes serious threats on the mental and psychological health of individuals. Cognitive dysfunction, frequent mood swings, memory issues, hallucinations, micro sleep, increased accidents, reduced work efficiency, slower response, dizziness and increased fatigue are few other effects of improper sleep on human health.